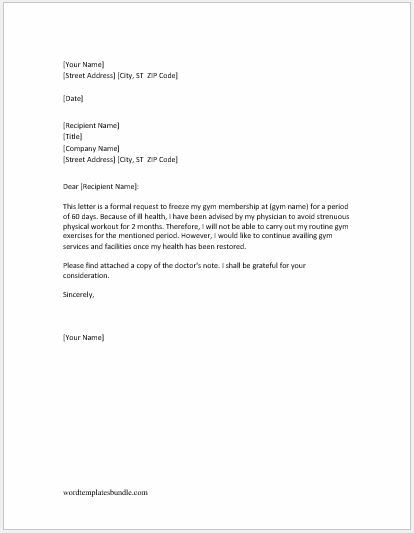 I am writing this letter to request you to cancel my gym membership. It has been a great experience with (gym name) and I have always been satisfied with your services. However, I am shifting to (place) permanently for my new job. It is for this reason that I will not be able to avail your services in future. Kindly go ahead with the cancellation process. I look forward to hearing from you. 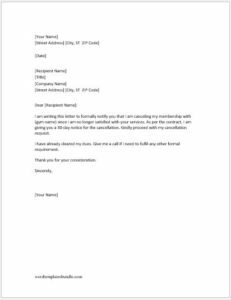 I am writing this letter to formally notify you that I am canceling my membership with (gym name) since I am no longer satisfied with your services. 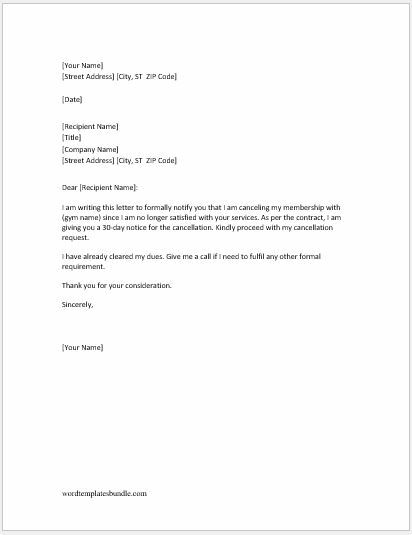 As per the contract, I am giving you a 30-day notice of the cancellation. Kindly proceed with my cancellation request. I have already cleared my dues. Give me a call if I need to fulfill any other formal requirement. This letter is a formal request to freeze my gym membership at (gym name) for a period of 60 days. Because of ill health, I have been advised by my physician to avoid strenuous physical workout for 2 months. Therefore, I will not be able to carry out my routine gym exercises for the mentioned period. However, I would like to continue availing gym services and facilities once my health has been restored. Please find attached a copy of the doctor’s note. I shall be grateful for your consideration. I am Dr. XYZ, a licensed medical physician working at ABC hospital. One of your clients, Miss Jane Kate is my patient. 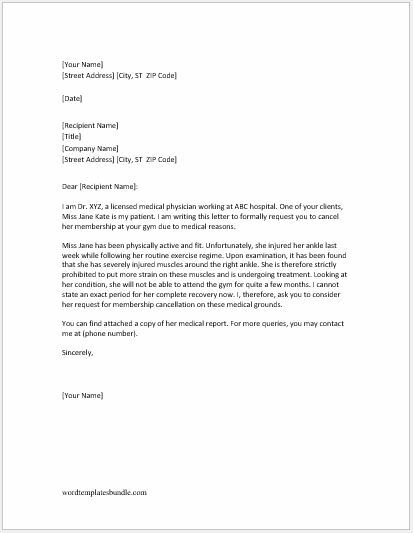 I am writing this letter to formally request you to cancel her membership at your gym due to medical reasons. Miss Jane has been physically active and fit. Unfortunately, she injured her ankle last week while following her routine exercise regime. Upon examination, it has been found that she has severely injured muscles around the right ankle. She is therefore strictly prohibited to put more strain on these muscles and is undergoing treatment. Looking at her condition, she will not be able to attend the gym for quite a few months. I cannot state an exact period for her complete recovery now. 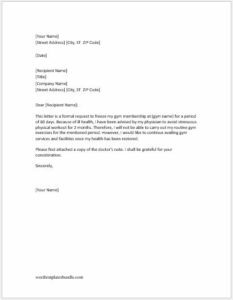 I, therefore, ask you to consider her request for membership cancellation on these medical grounds. You can find attached a copy of her medical report. For more queries, you may contact me at (phone number).